The Monterey Motorsports Reunion 2010 will celebrate motorsports legend Dan Gurney when it returns to Mazda Raceway Laguna Seca on August 13-15th. The feature titled: “Dan Gurney, the Cars He Built, the Cars He Drove” honors his role in shaping motorsports history by bringing together some of the historically-significant race cars associated with the legend. Considering that Dan drove over 50 different types of cars in 312 events worldwide, and that his All American Racers (AAR) Team designed, built and campaigned 157 racing cars with 66 different drivers behind the wheel during 35 years of competition, it becomes apparent that to make a selection was quite a challenging task. Many of these cars are still in existence today, owned by car collectors or driven on the vintage circuits by racing enthusiasts. Many of the people who worked at AAR through the last decades will join the Rolex Monterey Motorsports Reunion this August, including many AAR team drivers and Eagle customers who drove the marque to fame and victory. The exhibition presents a sample of the incredible variety of cars built and driven by Dan Gurney: Formula 1, sports cars, NASCAR, Indy, Trans Am, Can-Am, Formula Ford and Formula 5000. The cars have been beautifully restored by their present owners and are a stunning testimony to the ingenuity, hard work and perseverance of Dan, his family and his AAR team. The dark blue Eagle Gurney-Weslake V-12 number 36, known as one of the most beautiful Grand Prix cars ever built, is the inspiration for the 2010 Rolex Monterey Motorsports Reunion event poster. This car, owned by The Collier Collection in Naples, Fla., will be on display commemorating Dan’s win at the Grand Prix of Belgium at Spa in 1967. This is the first, and so far, only victory for an American in an American Grand Prix car in the modern era. A very significant race car will be on loan from the Henry Ford Museum, the red Number 1 Ford Mk IV which Dan and A.J. 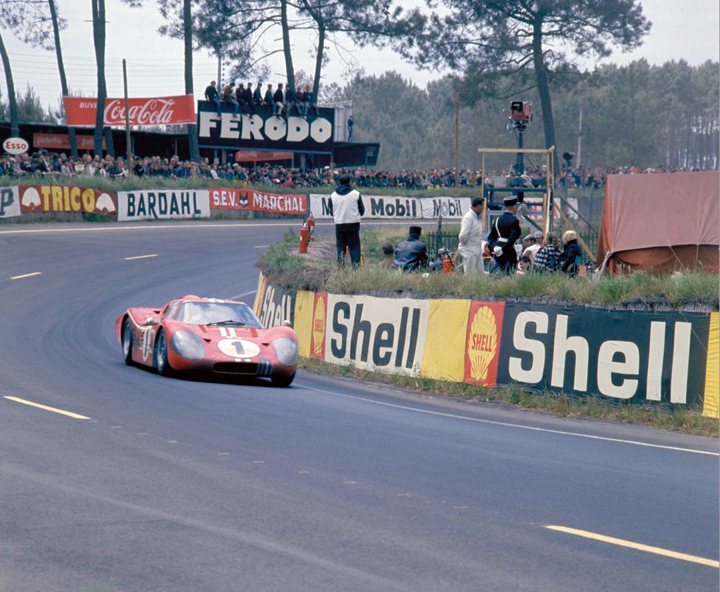 Foyt drove to victory in the 1967 Le Mans 24 Hour Race. It remains the only All American win at Le Mans: an American car, American engine, American drivers and American race team. It was on this particular Le Mans victory podium where Gurney spontaneously shook a magnum of bubbly, used it like a fire hose and sprayed everybody in a 15 foot radius, a gesture imitated by winners everywhere. Eagles played a major role at Indianapolis in the 1960s and 1970s, winning the USAC Indycar National Championships and the Indy 500 various times. Gurney won seven Indy car road races in his own car. The 1968 Rex Mays winner, Number 48, has just finished a full restoration and will make its first appearance. The aqua-blue 1975 Indy 500 winner, the Jorgensen Eagle owned today by the Collier Museum and driven into victory lane by Bobby Unser, will also be part of the show. The white Olsonite Number six Indy Eagle, which won the USAC Championship with Bobby Unser in 1974, will be there next to the gorgeously restored lilac-colored 1972 Indy Eagle driven by Jerry Grant. Car Number 31, built in 1966, owned by Doug Magnon’s Riverside Museum, is the very first Eagle ever built. It ran only 50 yards of the Indy 500 when it was hit by debris in a huge multi-car accident at the start of the race. Another notable Indy car out of Gurney’s stable is the yellow unconventional 1981 Eagle with a Chevrolet stock block engine. Mike Mosley put this car, the Pepsi Challenger, on the front row at Indianapolis in 1981 and scored a very popular win from the back of the field at Milwaukee two weeks later. The car that defined an IMSA Sports car era and set new standards for speed, technology and aesthetics is the Toyota Eagle GTP. Designed and built by AAR, it won two Manufacturer’s Championships and two Drivers’ Championships with Juan Manuel Fangio II and P.J. Jones. It was big, wide, beautiful, super-fast and it left the stage after winning the last 17 races the team entered. In 1962, a few years after the Daytona International Speedway was built, a 3-hour sports car race was introduced. Known as the Daytona Continental, it counted towards the FIA’s International Sports Car World Championship. The race was the forerunner of the 24 Hours of Daytona and Gurney won it in spectacular fashion. Driving a red Lotus 19 for the Arciero Team, he used gravity and the famous banking to coast without engine power over the finish line. That same year Porsche developed an 8-cylinder 1.5 liter engine specifically for Formula I Grand Prix racing. Gurney put the silver Porsche 804 into the winner’s circle of the 1962 French Grand Prix at Rouen, making this the only World Championship Formula 1 Grand Prix victory in Porsche’s illustrious racing history. He won another Formula 1 race at Rouen at the non-championship Solitude Grand Prix outside Stuttgart in the sister car, which will be in the exhibit. The game changing Indy 500 Lotus-Ford effort, which introduced the rear engine revolution at the Speedway, is represented by the Yamaha Lotus that Gurney put on the front row of the 1965 Indy 500 race. Representing a technological breakthrough is the 1960 “Birdcage” Maserati Tipo 61 that competed in the FIA World Sports Car Championship. This innovative car was driven to a tremendous rain and fog shrouded victory by Stirling Moss and Gurney at the famous Nürburgring 1000 km race. NASCAR racing is represented by the 1963 Riverside 500 winner: The Holman & Moody Ford Galaxie, which started a string of victories at that race. Gurney won with the Wood Brothers Team again in 1964, 1965, 1966 and 1968. Gurney won the first Can-Am race on U.S. soil in 1966 at Bridgehampton driving a Lola Ford. He later won two more races in McLaren factory machines, but campaigned a modified McLaren called the McLeagle, a stunningly beautiful machine, and a reminder of the unrestricted horsepower exuberance and freedom of the Can-Am era. AAR designed and built a series of Eagle Formula 5000 cars for customers which won the National Championship twice with Dr. Lou Sell and Tony Adamowicz. A later version of this car comes from Tom Malloy’s Museum. The Formula Ford Eagles are represented by a sleek Jorgensen Eagle which won the National Championship with David Loring in 1978. Last but not least: the “Cuda,” one of three 5 liter Plymouth Barracudas, built and campaigned by AAR on the Trans Am circuit in 1970. This car, co-driven with Swede Savage, has a cult following worldwide. In addition to the Gurney display, more than 600 historic racing cars from 13 countries will compete in 19 groups at the Rolex Monterey Motorsports Reunion. This year’s featured races are Formula 1, which celebrates its 60th anniversary this year; Trans-Am; and for the first time ever, Stock Cars (with drum brakes) that competed between 1959 and 1975. Additionally, there will be a dedicated grid of Bugatti race cars in the Bugatti Grand Prix, with some coming from as far away as Australia, France, Germany and Switzerland. For more information, visit www.MazdaRaceway.com or call 800-327-7322.